Explore the vast possibilities that resin has to offer to create a beautiful and interesting jewelry piece or mixed media finished composition. In this hands-on beginning workshop learn and explore using ice resin, an amazing jeweler's grade super clear resin, in combination with metal bezels. Be introduced to mixing in materials such as tints, glass glitter, mica chunks, paper images and lusters. Learn proper mixing, application, combining and pouring layers and safety tips. 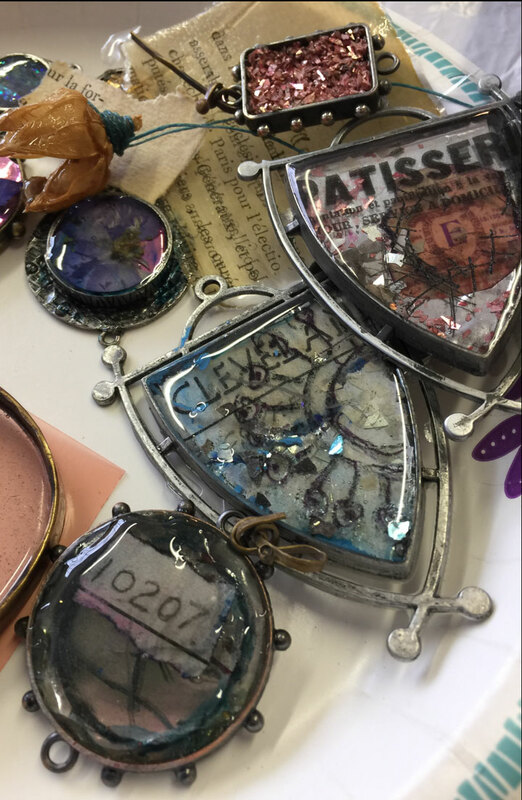 This hands-on workshop offers many foundational techniques from filling hollow bezel forms with photo text, foil and layering of materials. Bring images or small objects to put in your bezel.